What appears to be the next Turing graphics card launch from Nvidia has featured in a flood of leaks this morning. 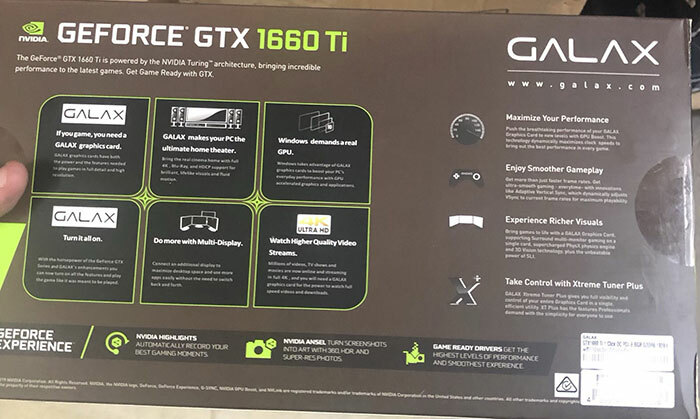 According to the most recent rumours, the Nvidia GeForce GTX 1660 Ti launches on Friday, 22nd February, previously we expected to see them officially appear on Friday, 15th Feb.
Firstly, a regular HEXUS tipster alerted me to a number of Galax GeForce GTX 1660 Ti packaging pictures shared on Reddit, hosted on Imgur. 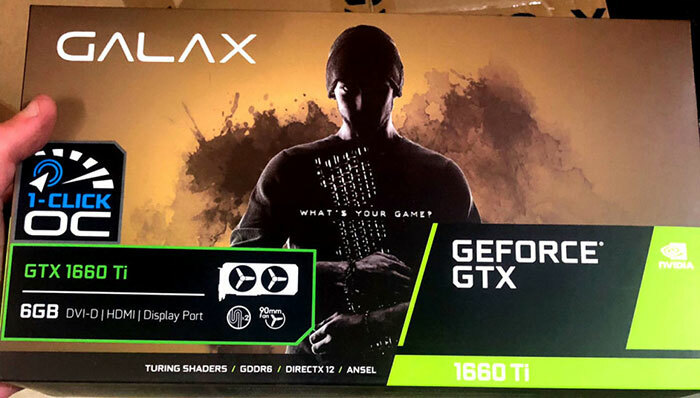 These are very clear pictures, showing the Galax branded GeForce GTX 1660 Ti packaging from various angles, taken in what looks to be the some kind of warehouse, storeroom or back-office area. On the front of the box you can see that the card features 'Turing Shaders' but of course there are no RT cores here. Elsewhere in the packaging blurb we learn that this card comes with 6GB of GDDR6, and allows for 1-click OC. Output ports include; DVI-D, HDMI, and DisplayPort. VideoCardz has followed up with two further leaks from its own sources. The Palit GeForce GTX 1660 Ti StormX and StormX OC are pictured by the site. These look like typical product page images featuring the card plus the carton in the background. It is explained that "both cards are equipped with TU116 GPU and 1536 CUDA cores", but that the regular card has a core clock of 1770MHz, which is raised to 1815MHz in the OC variant. Both Palit cards pictured use what appears to be the same compact single fan cooler. Last but not least, a pair of EVGA models with associated packaging are pictured. Both the regular and 'black edition' cards are here to be seen. VideoCardz doesn't have the core clocks of these models to hand. Recently, in EVGA products, such as the GeForce RTX 2060 XC, the black edition has been the cheapest model with slower core clocks. In our recent EVGA GeForce RTX 2070 XC ultra gaming and black gaming review, the latter was again the cheaper, slower sample. 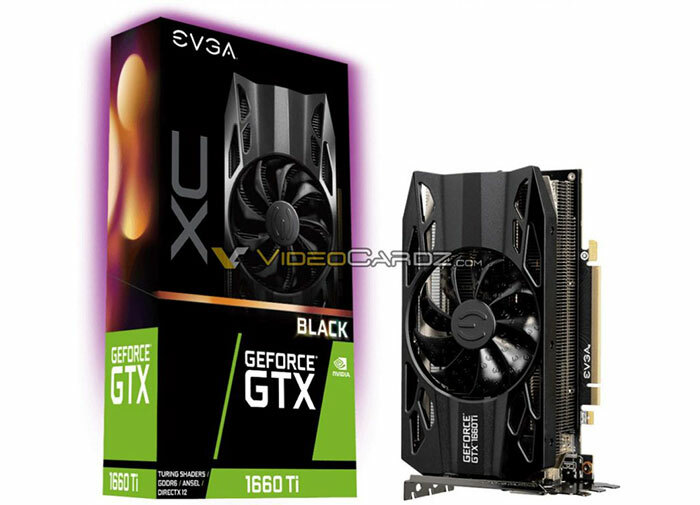 VideoCardz claims that the Mini-ITX form factor cards pictured will be the only models available from EVGA initially. Those wishing for dual-fan solutions will have to wait. I think Nvidia are making a critical error here by trying to saturate the market. My guess is they're trying to make a product for everyone whilst also using every bit of silicon when fab yields might not be great. The problem is complexity. AMD's range is so simple I can keep all the available cards in my head and do a comparison on the fly. Nvidia's range is so damned complex and varied that no one can do that and you basically need a spreadsheet to do anything like a realistic comparison to weigh up the pros and cons of the different models. Then on top of that, with one model having a wider memory bus but slightly slower core speed compared to another, who really knows (without spending hours reading reviews of all the variants within their price range) what impact this will have in the real world? The other issue is with all these models, Nvidia might be setting themselves up for a driver support fall. It has traditionally been the argument which can always swing you towards the green team if you're on the fence between green and red. If their driver support suffers because they're spending so much time developing RTX and now have a plethora of cards to support as well it may well mean AMD take the lead (although they've a LOT of work to do - Nvidia driver installation / update was seamless, AMD is like Russian roulette… will it work? Will I have to hit the reset button because the screen has gone all wappy and I can't see anything? Will it work when I reset it? Will it leave me with a blank screen, AGAIN? Urgh - no excuse for that in this day and age) with their much smaller range to support. I couldn't agree more with Phil. What's the point of pictures of these cards? 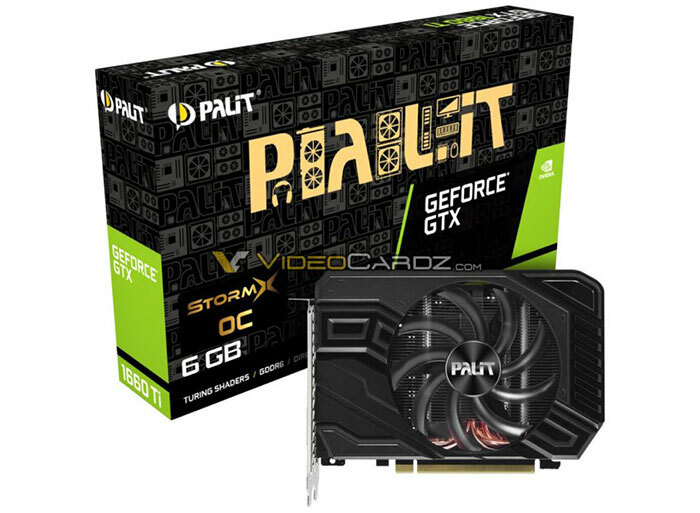 I have a 960 that could double as that Palit 1660.
if i can get 1070 performance for £250/280 i think I'll be sold. That's unless amd release navi in time. Nvidia driver installation / update was seamless, AMD is like Russian roulette… will it work? Will I have to hit the reset button because the screen has gone all wappy and I can't see anything? Will it work when I reset it? Will it leave me with a blank screen, AGAIN? Urgh - no excuse for that in this day and age) with their much smaller range to support. I haven't had driver install issues on AMD for …. a long time.